The coordinates are for the village sign. The cache is NOT there however there is a yellow Hydrant sign there that you need to go look at for some numbers. Don't worry, you CAN'T streetview it, you have to visit the village sign, which is OK, as the cache is only a 2 minute walk away! Note the published coordinates are east but the final eastings are WEST! If you don't make the switch you'll end up up someones drive! Lolworth is a small village and civil parish in the district of South Cambridgeshire, in the county of Cambridgeshire, England, located approximately 5 miles (8 km) northwest of Cambridge city centre. It lies on the A14 between Cambridge towards Huntingdon which provides the only traffic access to the village. The Prime Meridian passes through the village only around 50 metres to the west of the crossroads in the centre of the village. 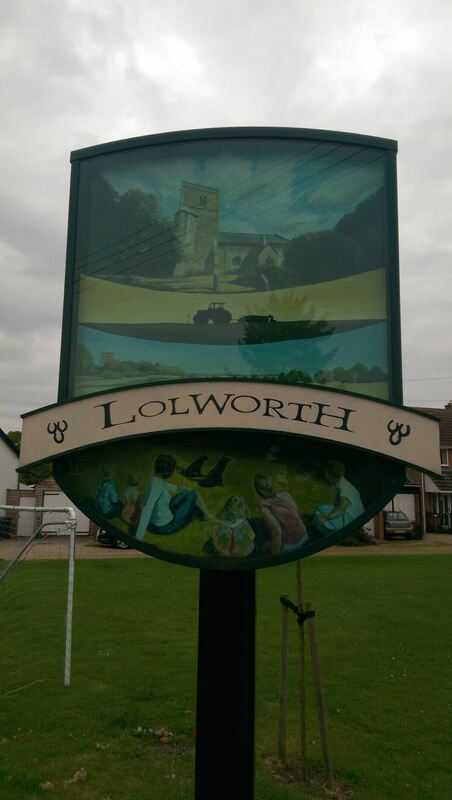 Lolworth is a small village and parish, covering only 449 hectares (1,110 acres). It owes its position to the Via Devana, the Roman road running from Cambridge to Huntingdon that became a turnpike between 1772 and 1876. In the early Middle Ages the village was well-populated for its size, with 154 adults registered for the poll tax of 1377, but the population declined sharply after that, perhaps due to a devastating fire caused by a thunderstorm of September 1393. By 1524 there were only 17 taxpayers, and the 17 families comprising 90 people listed in 1728 occupied only 6 buildings. The population reached a peak in 170 in 1871 and has been relatively steady at around 130 since 1961. The celebrated nineteenth century missionary Henry Martyn served in Lolworth as his first parish from 1803 to 1805, while he was a curate under Charles Simeon at Holy Trinity Church, Cambridge, before setting out for India and present-day Iran and Turkey. Listed as Lollesworthe in 1034 and Lolesuuorde in the Domesday Book, the village's name means "Enclosure of a man called Loll". There has been a church on the site since at least the 13th century, but the present church probably dates from just prior to its rededication in 1406, with the tower added later. This leads to the theory that the great fire of 1393 destroyed the existing church, as little earlier than this date survives. Dedicated to All Saints, the building comprises a chancel, a nave with south porch, and a three-storey west tower. The village is too small to warrant amenities other than its church. In 1960 local resident T. B. Robinson bought the former school from the county council and gave it for use as a village hall, which was then named after him. Lolworth has no public house but did have one alehouse, The Three Horseshoes, between the 1760s and 1798. The cache is within sight of the village sign so no need to go climbing all over the it!